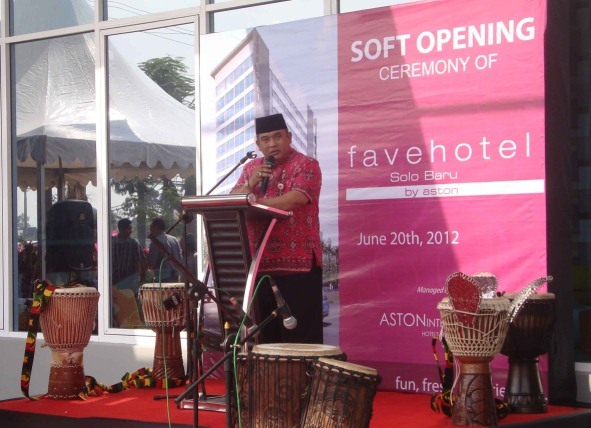 Jakarta, June 21st, 2012 – Aston International opened its second trendy select service favehotel in Solo, Central Java, the favehotel Solo Baru. The new “fave” occupies a strategic location on Jalan Raya Solo Baru in the immediate vicinity of Solo Baru’s popular Pandawa Waterworld and approximately 20 minutes from downtown Solo. With 153 fun, fresh and friendly rooms the new favehotel Solo Baru aims to become the area’s best in class select service hotel and affords facilities and amenities usually found in more up market hotels such as several functional meeting rooms, a semi basement with covered car park, a lobby shop, a café with out- door seating and a bar. Guest rooms are equipped with LCD televisions, top of the line beds with quality cotton bed linens and duvets, free and “truly” high speed WiFi and a complete set of complimentary in room amenities such as fluffy cotton towels, bathroom amenities, individual controlled air-conditioning and save deposit boxes. Snapshot Opening favehotel Solo Baru, seen in the image Mr. Owen Thomas Colville – Corporate Executive Chef (left) and Ms. Aris Retnowati – General Manager of favehotel Solo Baru (right) together cutting ribbon as an official opening of favehotel Solo baru. favehotel is a new select service hotel brand established by Aston International, Indonesia’s largest Hotel Group, aiming to offer inexpensive, fresh, attractive and contemporary hotels to smart budget minded travelers. Since its inception in July 2009 favehotels have been in the forefront of the budget hotel sector redefining the industry’s standards for select service hotels through imaginative design, mid market features such as high quality beddings, complimentary high speed internet access and LCD televisions and have received accolades for their user friendly website offering instant easy bookings and best rate guarantees for internet savvy customers. favehotels currently operates 8 hotels in Jakarta, Bali, Bandung, Solo, Surabaya and Langkawi and has a large development pipeline in Indonesia, Malaysia and the Philippines. favehotels aims to become Indonesia’s best in class and most consistent budget hotel chain promising uncompromising standards for cleanliness and safety and a network covering the entire archipelago. The group has announced plans to open close to 20 new hotels this year covering destinations such as Bali (5), Balikpapan, Bandung-Braga, Bogor, Jakarta (4), Pekanbaru, Serpong (2) and Yogyakarta. Aston International entered Southeast Asia in years ago and has since become a prominent international player in the Indonesian hotel market, with offices in Bali, Jakarta, Surabaya and Yogyakarta. Aston properties currently operate in Indonesia, Malaysia and the Philippines under the five-star Grand Aston and Crimson, deluxe villa Royal Kamuela and Kamuela, four-star Aston, three star Aston City and Quest, boutique budget class Neo hotels and select service favehotel labels.